Back in June 2002 we featured a dramatic sky picture by John H. Farr. Later in the piece we mentioned the 'Viewpoints' exhibition by Ruth Wallen, regretfully having to amend that item afterwards, saying that the resource we had linked to no longer existed. Unfortunately we were unable to find on the web a similar resource that explained what we were trying to illustrate. 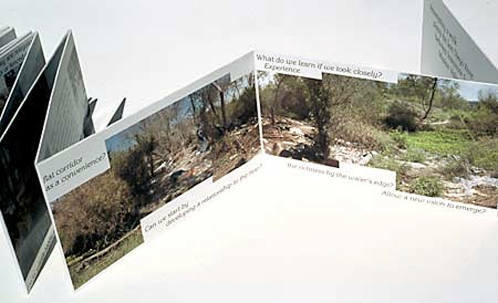 We are now glad to say that Ruth has written to tell us that she has established a new home for her ecological art. Once again there is a resource we may point to when we need to explain Claude Glasses, and remember to mouse over those images when you visit. The sitemap is rarely a bad place to start on a first visit. and from there we picked 'When a City Turns its Back on its River'. Hmmm… the type of project for which a web site and a digital camera would be needed, eh? Ruth's piece prompted us to look for more on the SDR (San Diego River). Kayaker and unpretentious webmaster Ben Balanag confirms Ruth's observations on access to the river, but solved the problem by travelling in his boat. There are some who do care about the river: there are consciousness raising efforts by the Californian umbrella organization, 'Friends of the River', alongside local organizations like the 'San Diego River Park Foundation', and 'Project Clean Water'. For those interested in examining the whole river system a local newspaper, 'The San Diego Union-Tribune', has a web site featuring a fascinating three part series by staffers, writer Peter Rowe and photographer Earnie Grafton. Finally, anyone who follows our own pursuit and researches image sources, may enjoy a visit to the San Diego Historical Society photo library. We particularly enjoyed the 'View Cards' set on the construction of the flume to bring water to the city. American singer (1938- ). This man's discography is seemingly endless, though we confess that after sharing a house with someone who had one of his early hits on autoplay for three days, hearing that same song again gives us hives. No disrespect is intended, however, because anyone who has recorded one of our favorite songs, with one of our favorite female singers for whom we have the hots, on what his web site claims is the biggest selling country music single ever, has got to be at least halfway good. The pair have been back in the recording studio to make a track for his forthcoming album. During our research we were amused to discover a site devoted to men who look like today's subject; there are over 1,000 of them in the galleries! The site even include a celebrity look alike section, and a Top Secret Recipe for sweet corn muffins, claimed to taste just like those he served in the chain of fire roasted (It's the wood that makes it good.®) rotisserie chicken restaurants that bear his name (check that page for a wonderful euphemism: what is elsewhere described as the 1998 'bankruptcy' is here described as a 'restructuring'). This entry was prepared using our subject's official web site, where you may hear a full version of his latest single 'I'm Missing You' (RealPlayer software required; download link available on that page). 1945 - The Vietnam Conflict began less than a week after the Japanese surrender in World War II, when a team of Free French parachuted into southern Indochina in response to a successful coup by Communist guerrilla Ho Chi Minh. This must be a good day for starting wars: the English Civil War also began on this day in 1642, and in 1846 the United States annexed New Mexico. It is merely happenstance that today's archive item also features New Mexico and the Rio Grande. Nevertheless a rather worrying occurence, because as we all know, at the end of the long arm of coincidence lies the fickle finger of fate. Today's picture of the Taos Gorge Bridge over the Rio Grande in New Mexico comes from John H. Farr's web site at FotoFeed.com (links to other Farr features in the sidebar). When it was completed in 1965 it was known as 'The Bridge to Nowhere' because funds ran out to link the bridge to the existing highway system. It now carries US64 from Taos, New Mexico, to Farmington, NM. When we passed this way we were taken completely by surprise. One moment we were driving across an enormous flat high altitude plain, the next moment we were winging across an airy bridge crossing a river whose name is legendary. The structure is claimed to be the 'World's Most Beautiful Steel Span Bridge'. More objectively it is claimed to be the second highest bridge in the USA, though figures for the drop to the river below seem to vary widely between 600 and 800 feet. Geologically the Rio Grande is unusual, because rather than running in a gorge that it has cut itself, it runs in a ready made tear in the earth's crust riven by another form of arching on an even grander scale. Steven Wade Veatch has a page with all the details. The always impressive Virtual Guidebooks web site has a 360 degree VR panorama of the gorge, and other sights in the Pueblo Country. There was an appalling murder here on 23 November 1998, when Erik Sanchez, 18, from nearby Espanola was thrown from the bridge. The following information has been garnered from many web sources, so its accuracy is questionable. Indeed one newspaper archive I searched had the date of the murder as 1997 and 1998 in consecutive search results. Reports I read suggest that Luis Acosta, 19, of Ranchos de Taos and David Sandoval, 24, of Taos were charged with first degree murder, 2 counts of armed robbery and single counts of conspiracy to commit a felony and first-degree kidnapping, with the death penalty sought. It was alleged that the accused killed Sanchez for his customized car, which they allegedly planned to sell in Mexico for money to buy drugs and Christmas presents. It was also alleged that Sanchez was beaten, strangled with a shoelace and stripped of his clothing, then driven to the Rio Grande Gorge bridge, where he regained consciousness and tried to escape but was overpowered, according to Sheriff Charlie Martinez. Sanchez clung to the railing as his hands were kicked until he fell to the bottom of the gorge, Martinez said. Defence attorneys Carmen Garza and Gary Mitchell claimed that although the idea might sound ludicrous, Acosta thought Sanchez could fly. They alleged their client had used an extensive amount of cocaine, and was under the influence of either drugs or alcohol at the time the killing occurred. As best as I have been able to ascertain from reports it seems that Acosta and Sandoval eventually pleaded guilty, and were sentenced to life plus 71 years, and life plus 75 years respectively.